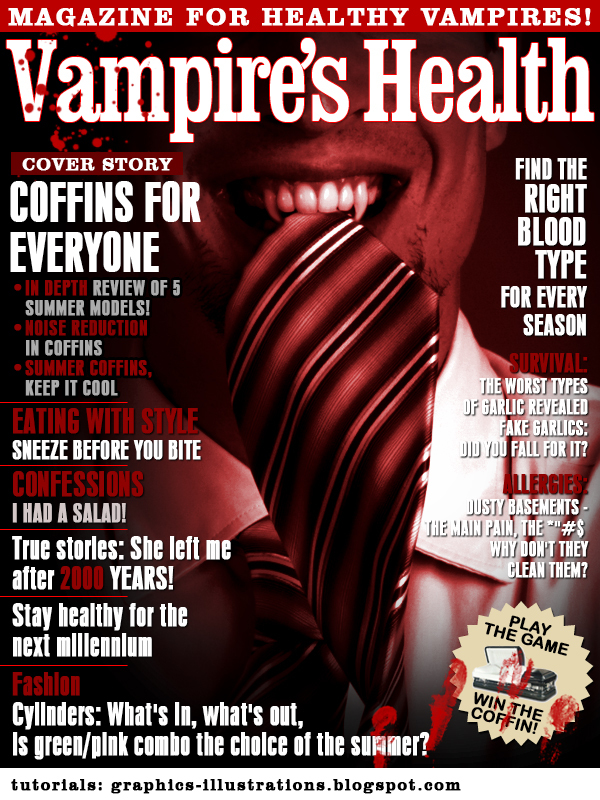 Following the rumors on more and more people claiming to be Vampires, I decided to start a magazine “Vampire’s health”, or at least design a cover page in case anyone ever decides to make a magazine for that particular “type” of people. So, since I took the time and effort to make this cool cover page, thought I might as well show you how it’s done 🙂 so if you are into or plan to become a professional graphic designer this will be funny and cool way for you to learn how to make a cover for the magazine. This is a part one of the tutorial named: “How to make a cover page layout for the Vampire’s Health magazine” Examine the cover page very closely before proceeding with the tutorial. As you can see, a good copywriting is a part where graphic designer and the editor get the inspiration from. The rest is “just” Photoshop. Tutorial is finished. Report from Europe: Unexplored undergrounds – The Paris underground secrets revealed! Lifestyle: The thrill of the last three minutes before sunrise; push your adrenaline to the next level! A complete vampire’s weight loss program, loose 2 pounds in 7 nights! Complaints: FedEx delivered in daylight? Why can’t (don’t) they understand? Travel: Traveling across the ocean: Getting there (in a) safe! The best cargo agencies Tschau! Very funny 🙂 I’m sure the vampires will leave you alone out of kindness now! I Highly Dout The Vampire’s Will Leave Human’s Alone. Hi, The tutorial mention how to make a cover layout is not available, can you direct me to righ place to find it. Please bsilvia keep making these you have fans ! !